“Your courage will be put to the test. Now that we have the airship, we have the opportunity to make our characters stronger. To do this, we must collect a Rat’s Tail from an enchanted castle, and then give it to Bahumat, the King of Dragons. Sound complicated? It’s not, but we must first prepare for the journey. North of Crescent Lake is a city called Gaia. 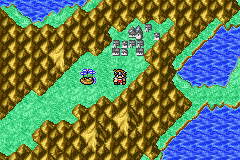 It is completely surrounded by mountains, so it’s a good thing that we have an airship. If you have trouble finding the city, look at the World Map excerpt for Section 7. In Gaia, we will find a lot of useful, even if expensive, equipment. There are many items here that will prevent some of the one-hit killing attacks we have been facing recently. Unfortunately, there is only one spell that we can buy. All the others will have to wait until after the Class Change. This is the last time you’ll get to park the airship right next to a newly discovered location. Savor the moment. A weapon with razor-sharp blades. An armlet ornamented with rubies. Ring that guards against instant death. Fully restores one ally’s HP. Deals ice damage to all foes. Damages all foes with holy light. Reduces damage from spells by half. Negates one foe’s magical defenses. Stops time and paralyzes all foes. Banishes foes to another dimension. Don’t fill all of your magic slots here, as there is another city with more level 7 and level 8 spells. Once you have finished upgrading your equipment, exit the city and launch the airship. It’s time to find the Citadel of Trials. To reach the Citadel, head southwest from Gaia. It’s on this same continent, so if you go over ocean, you’re going too far. Once you see the castle, you’ll notice that this is no good place to lead nearby. I have marked on this map a couple of suitable landing locations. Once the airship is down, hike to the Citadel. Upon entering the Citadel, you will find an old man. Since you have the Crown, he will let you pass. I love it when a previously required item is needed twice. After he let’s you pass, head to the northwest. You will find a room with a throne. Walk onto the throne to proceed to the second floor. Who would build a castle in the middle of a swamp? 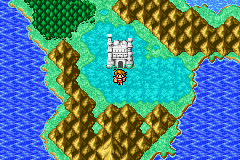 Or was the castle built, then suddenly a wild swamp appeared? On the Second floor, you will be presented with a teleportation maze. If you step into the wrong teleporter, you will be returned to the beginning. On the map, I have marked the teleporter that you want to take next. The only treasure to worry about is the Gauntlet in the northeastern chamber. Make sure to grab this item, as it casts Thundara when used in battle. At the end of the maze, you will find a staircase leading to the third floor. There is no maze on the third floor, and there are several important items to be found. Make sure to grab the Heal Staff, as this item casts Healra in battle. Pretty soon, you won’t have to use MP anymore! I recommend using the manual sort option on the item screen to move the Heal Staff to the top of the list. This way you can use it in battle without wasting time scrolling all over the place. When you get to the end of the hall, you will find a treasure chest that is guarded by several Dragon Zombies. They shouldn’t be a problem. As a matter of fact, since they give good EXP, I would recommend fighting them a couple of times to increase your levels. After grabbing the Rat’s Tail from the treasure chest, walk onto the throne. You will be transported back to the entrance. 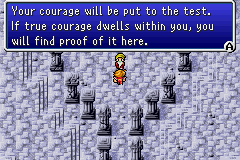 Oddly enough, the Citadel of Trials is more a test of patience than courage. Can you be patiently courageous? After leaving the Citadel, walk back to your airship and take off. You need to head to the small islands southwest of the Citadel of Trials to find the Dragon King. Please refer to this map to see which island has which items, and which island is home to Bahumat. Once inside Bahumat’s island, you will get to walk down two of the longest hallways you can imagine. Besides boredom, there are no threats to be found. Once you reach Bahumat, give him the Rat’s Tail. You will be rewarded by a Class Change! The most notable change to your characters is the ability to equip more items and learn more powerful spells. 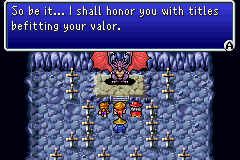 At least on the way out of Bahumat’s lair, you get to admire your new character sprites! You can call me Mister Warrior. Or Knight. Knight works too.